SAVE 50% – NEW YEAR SALE! Full Membership for just $18.50 if you join TODAY! I Can Have You Playing Boogie Woogie Piano Within Minutes From Now! No Need To Read Music – No Previous Experience Necessary! Start playing right away, even if you’ve never played before! You don’t need to read any music! I will show you what to do as you look over my shoulder! Your first few lessons are FREE – with no catch! No need to part with a penny! You’ve Always Wanted To Play The Piano – So Why Not Start Now? 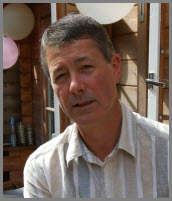 Hi, my name is John Branton, and I am a fully qualified music tutor and examiner, and I would like to teach you how to play Boogie Woogie piano! Have you always said “I’d love to be able to play the piano”? I bet there have been many times when you’ve watched and listened to someone playing and thought you really must learn to do that. But you didn’t ever learn right? Look, I’m not going to beat you up over it! That is typical of MOST people, which is why when you go somewhere that has a piano sitting in the corner of the room, MOST people don’t go over and play it! But what if YOU COULD PLAY IT? How would it feel if you could confidently stroll over to the piano and start playing some boogie woogie piano? Everyone loves Boogie Woogie, and I want to let you in to a little secret…you don’t have to know it all! Once you’ve learned a few of my boogie riffs you’ll be able to put them together and make it sound like you’ve been playing for years! Learning to play the piano may seem daunting at first, especially if you are a complete beginner, but like most things in life, if you chunk them down and make them more manageable you can make massive progress in a relatively short period of time. That’s exactly what I’ve done with How To Play Boogie Woogie Piano Volume 1! 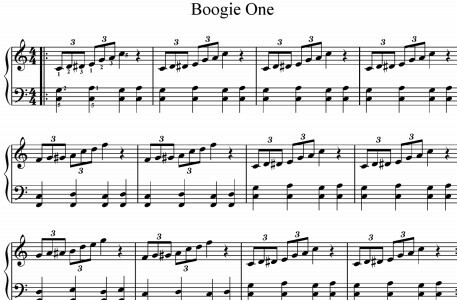 I have put together a full introduction to Boogie Woogie piano, that, even if you have no previous experience, you should be able to get started with and get results very quickly. In fact, I believe that you will be amazed at how much progress you can make in a very short period of time! This course is easy to follow, and each lesson is chunked into a simple, short video presentation that literally takes you by the hand and guides you to Boogie Woogie success. The lessons have all been filmed in my tuition studio at my home, in the very same room that I teach pupils every day to play many different musical instruments, including the piano, and of course, including Boogie Woogie piano. I’d love to teach you one on one, but I simply haven’t got the time to do that. So the very next best thing is to offer you this home study video course, so you can learn from me at your own pace, in your own home. I am so confident that you will be 100% delighted with this course that I am offering you a 100% Money Back Guarantee! If you do not feel that you have received value for money, simply contact me, explain your reasons, and I will offer you a full refund. So you have absolutely nothing to lose! Why not jump straight in and grab your copy now! This Is A No Brainer! You Have NOTHING To Lose – And You Could Be Playing Boogie Woogie Piano In Front Of Your Friends & Family In No Time! What is it that you want from this course? Have you ever played piano before? Are you a complete beginner? Are you an experienced pianist with no knowledge of Boogie Woogie Piano? Wherever you fit in above, I can tell you that this course will fit you! Having taught literally thousands of students over the last four decades (yes I started very young! 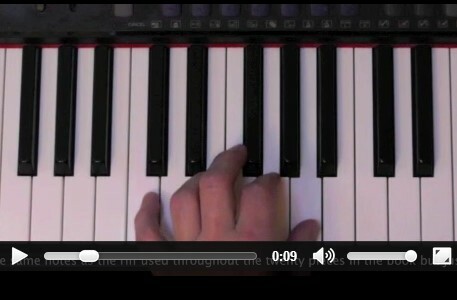 ), I know that this style of piano suits students at any level. Well, each video lesson is only a couple of minutes long, so that part won’t take up too much of your time. The essential thing is that you practice. And if time is tight for you, then start with just 10 minutes a day and you will make good progress very quickly. Can you manage 10 minutes a day? Sure you can! We have purposely priced this course at a level that we feel is affordable for everybody. If you are serious about learning an instrument then it’s likely that you will need to invest some money at some stage, but at the price we are currently letting the course go for, this is likely to be the smallest investment you will make in your musical career! 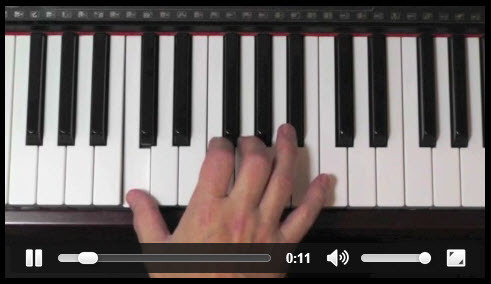 There are 20 main Boogie Woogie video tutorials and 4 left hand video tutorials. Each tutorial has an accompanying written page, complete with musical notation and some notes from me. I’ve produced video tutorials, in an ‘over my shoulder’ format. Once you’ve decided to invest in yourself, and join me at Play Boogie Woogie Piano, you will have full access to all the videos inside the members area. You can watch them at your own pace. Watch a bit. Play a bit. Pause, rewind. It’s all AT YOUR PACE. Even though you don’t need to read music, I appreciate that many of you will either already be reading music, or will want to (or at least have the choice). 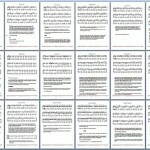 So I have produced a full workbook for this course, complete with individual music scores, and guidance notes, to accompany my videos. As I am a real person, I thought it would be the icing on the cake to give you access to me to ask me any questions you may have when starting out with Play Boogie Woogie Piano. So when you become a full member you will also be able to contact me directly to ask a question, or seek some help or advice. My good friend (and former student) Trevor and I have had great fun putting this course together! Boogie Woogie Piano is itself in essence a ‘fun’ way of playing the piano, and we are both excited to know that we will be helping new piano players from all over the world to discover and develop this exciting skill. With each lesson we have also provided you with a downloadable PDF file. You can view this on your screen or print it off to have with you by your piano or keyboard as you learn. Remember you don’t need to read music to learn how to play Boogie Woogie Piano with this course. This is just an added bonus. Those of you that like to read music might find this useful. You will be receiving your instruction from John Branton; a life-long music professional and educator with over 40 years of tutoring experience ranging from complete beginners to preparation for Fellowship examinations which have the equivalence to Masters Degrees. His work at home in the UK and internationally as an examiner, adjudicator, performer and workshop presenter gives him a unique outlook on music education and makes him an ideal and safe guide through your musical education. The Closest Thing To Dr. Boogie! Dr. John ‘Boogie Woogie’ Branton commands a high hourly rate for his musical tuition, and for good reason. And aside from the uber impressive title, he is an absolutely awesome music tutor. This material has been written and compiled by Dr. John himself, and then demonstrated on video for you to consume as if you were in the same room, having a private one on one lesson. We’re even giving you FREE support for the first 30 days, directly from Dr John himself. So if you get stuck, have a question, or just need some advice, you can contact John for personal support to get you back on Boogie Woogie track! There will also be a Member’s Only Facebook Group that we encourage you to join, where you can share tips and experiences with fellow Boogie Woogie players, as well as ask Dr. John and the team for help and advice. We’ve had great fun putting this course together, and are excited to spread Dr. John’s teachings across the globe. Over the years John has successfully taken complete beginners from having no idea where to start, right through to becoming competent boogie woogie pianists. Dr. John and the team here at Play Boogie Woogie Piano are determined that you have a great experience with this course, and if for any reason you are not 100% satisfied with what you have paid, we will provide you a full refund, no questions asked. Each video lesson is short and sweet. Even a complete beginner will be able to fully grasp the concepts taught in this course, and you can be playing Boogie Woogie Piano literally within minutes! Now we’re not saying you’ll be note perfect within minutes (although this is certainly possible if you have had some piano playing experience already), but with practice, you will find that you make very satisfying progress as you work through the course. They Laughed When I Sat Down At The Piano. But When I Started To Play…. Dr. John taught me the material in this course a few years ago. Since then I’ve been knocking out Boogie Woogie wherever I go! If there’s a piano lurking in the corner I’ll hunt it down, and bring it to life! It’s been a great skill to learn that has not only been therapeutic, but beneficial to my business, as it has been a great ice breaker at networking events. I love teaching. I love teaching the piano. I really love teaching Boogie Woogie Piano! So it probably comes as no surprise that I am genuinely excited at the prospect of ‘meeting’ new students from all over the world. My Boogie Woogie course has been designed to get you started as quickly as possible, and don’t forget, I’m here for you if you need me (not 24/7 mind! I do travel a lot ). So go ahead, grab your membership below, and you’ll have INSTANT ACCESS to the course. Join me today at Play Boogie Woogie Piano, and I will give you 3 Boogie Woogie Piano Bass Lines absolutely FREE. 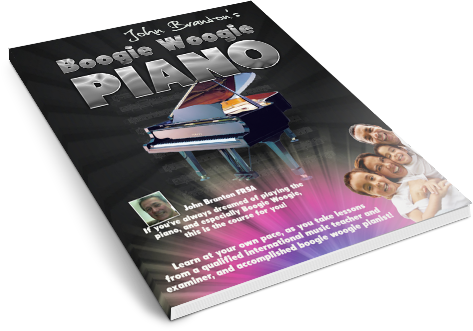 Aside from the separate PDF downloads on each lesson, I’m also including the full PDF eBook, John Branton’s Boogie Woogie Piano, as a separate product. You could print the whole workbook out if that’s how you prefer to work. My Over The Shoulder Video Tutorials Are Waiting For You! Once inside, I’m going to kick off by teaching you a simple, yet very effective bass line for your left hand. Once mastered, you will move on to the boogie woogie melodies. There are 20 video tutorials covering these melodies, so you will find plenty of variety to keep you interested. You might want to learn one left hand riff, and then one right hand riff and put them together as soon as you have each of them mastered. It’s a very flexible way of playing the piano, so you can tackle it the best way for you. The way that you find most fun, and most rewarding. I have been working on the free lessons and they are absolutely great! My piano tuner ( fourth generation of piano tuners!) always plays boogie woogie when he has finished and I have always wanted to play BW myself. 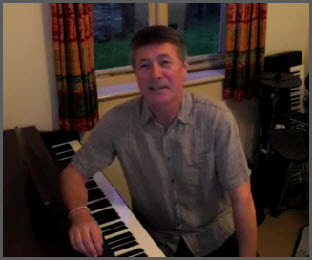 So, I am thrilled to have found John’s lessons which are perfect and so easy to follow with the video, which I think is a key feature whether you can read music or not. i have bought other cds before but they have just been audio and it just does not work, listening to a description of which finger to put on which key, with no visual. I think my piano teacher will have a fit!! I’m making progress, but since I’m a fairly unexperienced pianist every detail takes a lot of practise, and progress is slow (but steady). I find your video-lessons very clear and easy to follow, so with the help of your instruction and a lot of work on my part I’m sure I shall be playing som nice boogie woogie one day! 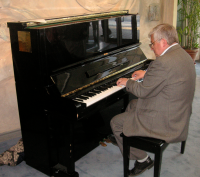 Hi Everyone – After many years of trying to find a good quality Boogie Woogie piano program, my search was rewarded when an e-mail arrived with an offer for learning Boogie Woogie piano. To my amazement, the program is reasonably priced and has nice, short video lessons ( 1 or 2 minutes in length) on how to actually play the boogie woogie in a very short time. I highly recommend this program and would like to thank the two guys responsible, John and Trevor. They are really great guys! The Best of Luck to you and thank you for helping me with my piano lessons. Awesome! I’m already a swingin boogie man Daddio! Thanks John. Really enjoyed the course, and found it really easy to get started. I was playing within minutes, literally! Looking for that piano in the corner of the room all the time when I’m out now! for FULL Membership and Instant Access! Once you’re paid and ‘through the door’, you will have full access to the entire Play Boogie Woogie course, which includes the 20 Boogie Woogie Video Tutorials, the Left Hand Bass Riff, the individual PDF music work pages for each lesson, and the full PDF eBook Workbook. You can fire me a message via Skype or email, whenever you need some clarification, some answers or some guidance. All the material on this course has been put together by me, so there’s nobody better qualified to help you! The price that you will pay today could go up at any minute. We have sold this course on the physical market with great success, and now we are going globally digital and testing the market. So take advantage! If we have the price point to low, that’s your gain!